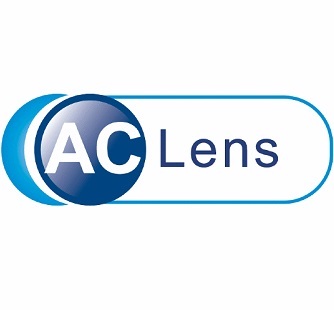 Contacts Advice is a professional contact lens price comparison site that receives compensation from the companies whose prices we research. We also receive compensation from companies whose websites we review, such as the one on this page. We are independently owned and the opinions expressed here are our own. In this EzContacts review, I will discuss the features of the website and how they can offer the absolute best contact lens prices on the internet. EzContacts provides all the major brands of contact lenses, from all the major contact lens manufacturers, in all available formats. Contact lenses on EzContacts are well organised and your brand is easy to find. 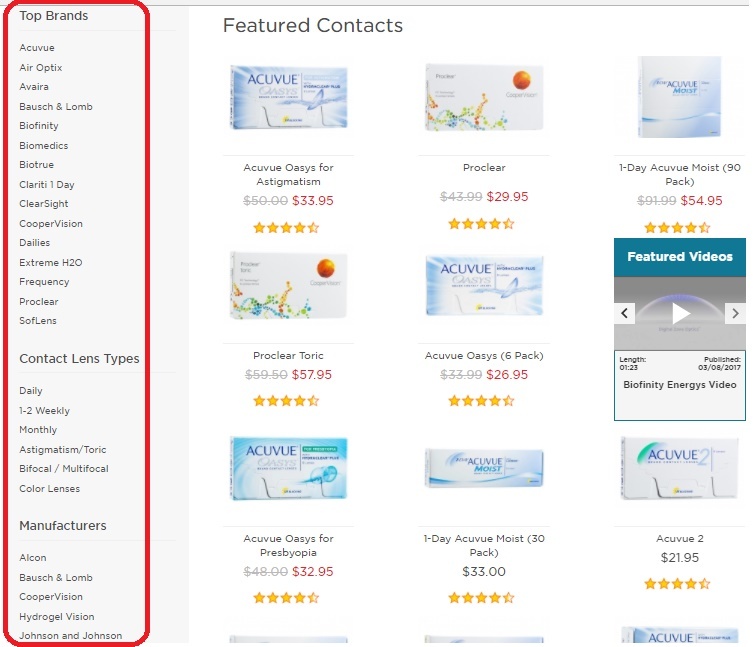 You can navigate the site by Top Brands, Contact Lens Types or Manufactures. Despite their name being EzContacts, they sell glasses and sunglasses as well. 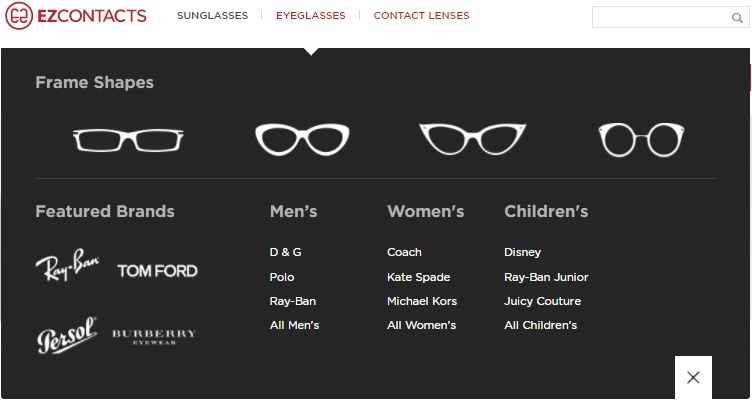 And not just any glasses, they sell all the top brands such as Raybans, Tom Ford, Persol, Burberry, etc. If you’re looking for a specific brand or frame of glasses, you’re very likely to find it at EzContacts as they sell over 10,000 different frames. Good customer service is extremely important at any contact lens website. EzContacts provides several methods to get in touch with their customer service team. The regular prices for contact lenses at EzContacts are not the lowest available on the internet. On average they are about mid-range compared to other contact lens websites. Are There Any EzContacts Coupon Codes? Coupon codes are generally not an effective way of saving money on contact lenses. Whenever you are offered a coupon code for 5%, 10%, or 15% off, know that even with the discount, you are still overpaying for your contact lenses compared to other sites which simply have much lower prices. For an in-depth explanation of why coupon codes actually cost you money, including numerous real-life examples, read this article I wrote about 1-800 Contacts coupon codes. So why did I title this article ‘EzContacts Review – Offering the Best Contact Lens Prices on the Internet’? It’s because they have a 105% price match guarantee, meaning that they will beat the price of contact lenses at any other site by 5%. Without their price match guarantee, EzContacts might look a lot like most other contact lens websites. But their price match guarantee is what takes them from being a good place to buy contact lens online, to very the best place. EzContacts Will Beat Any Price by 5%! That’s right, not only will they price match any price found on other contact lens websites, they will beat that price by 5%! Other contact lens websites have price match guarantee policies too, but EzContacts.com is the only site that I’ve seen that will beat any price by 5%. Others typically offer 2%, or simply a price match with no additional discount. A price match guarantee is great but to take advantage of it to the fullest you need to first find the lowest possible price for your brand. Researching dozens of sites to find the lowest price for your band can be long and tedious, especially if you’re not familiar with all the different contact lens websites out there. But with Contacts Advice, the whole process takes no longer than a few seconds. Simply navigate to Contacts Advice’s homepage, scroll down until you find your brand and you’ll find a link that will take you directly to the website with the lowest price for your brand. 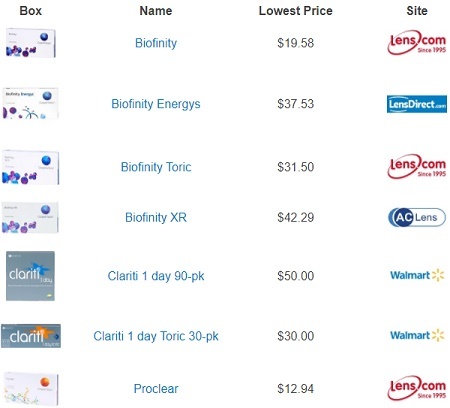 I perform price checks for over 50 brands across 12 contact lens sites every week to make sure you always know where the lowest price for your brand is. 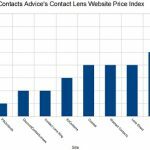 The lowest price will be listed next to your brand on the homepage and the prices across every website can be found in the contact lens price comparison chart at the bottom of the page. Once you’ve located the lowest price through Contacts Advice, take a screenshot of the total for your order, and note down the URL. You may need to send them to EzContacts later. Next, you will have to purchase your contact lenses from EzContacts.com. When your purchase is complete, you will have to inform EzContacts.com about the lower price that you found for your brand. 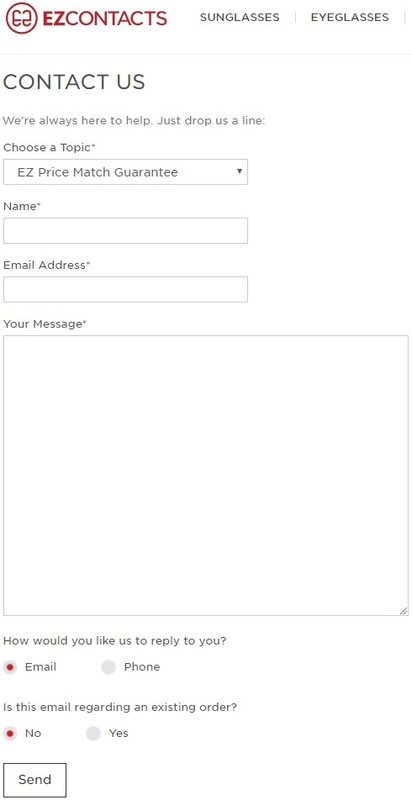 You will be taken to a page with a contact form. In the message field, you can copy and paste the following message and edit the necessary parts. I just placed an order for contact lenses with you. My order numbers is [enter order number]. I purchased [enter number of boxes] boxes of [enter name of brand] for a total of $[enter total of your order]. For the same number of boxes of the same brand at [enter name of site that you wish to price match], the total is $[enter total found at the website you wish to price match]. I have a screenshot of the total at this site, as well as the url, which I would be happy to provide. I would like to utilize your 105% price match guarantee. Please contact me via email so that I may send you my screenshot and url. Once your request has been received and approved, you will be contacted by a manager and refunded for the appropriate amount. 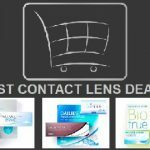 How to get the absolute lowest possible price on contact lenses. Step 1: Locate the lowest price for your brand. Take a screenshot of the total and save the link. Step 3: Email EzContacts, provide them with your screenshot and link. It’s a little more work but if the extra savings is worth it for you, now you know how to get the best contact lens prices on the internet. Important Note: When asking for a price match, make sure you quote the total price of your order, not just the price per box. Also, make you are comparing two identical products. Click here to find the lowest price for your brand. Click here to shop at EzContacts.com. What’s Your Experience With EzContacts? If you have experience with EzContacts, specifically claiming their price match guarantee, please leave your experience in the comments below.